Uyah Amed Hotel & Spa (Amed salt Lodge & Spa) is located in Amed, East Bali, an area known for its Naturschöheit, fantastic dive sites and traditional Balinese lifestyle. Uyah Amed Hotel & Spa is located on the beach and is committed to the preservation of traditional sea salt. Uyah Amed Hotel & Spa also offers PADI diving courses and diving & hotel accommodation packages in conjunction with our Amed Dive Center at – all in an environment friendly resort. Cafe Garam (Salt Cafe) is part of Hotel Uyah Amed, Amed the salt hotel. Garam is the Indonesian word for salt – the Balinese word for Uyah and salt. In mid-2000 we were sitting in Amed and talked about the massive changes in Amed Area, which are caused by the growing tourism. More and more of the salt-producing fields were not used or sold by their owners to investors who build hotels, etc. on it. Since we did not want the traditional sea salt in Amed disappears totally, we have developed an idea, how can we maintain this tradition for the people of Amed and interested tourists. In order to combine the development of tourism with traditional life in Amed, we have our hotel Uyah Amed and his Cafe Garam built around the salt fields, have made the sea salt production to our motto, and thus actively support the people of Amed and their traditions. We want to support the production of salt by making this tradition known as a tourist attraction and show our visitors the process and explain. We are winning sea salt during the dry season (it is only possible) and then store the delicate sea salt in our traditional bamboo camps “Gudang Garam”. You can buy this delicious sea salt with us! Since we want to contribute to the sustainable development of this extraordinarily beautiful part of Bali, we strive to provide our services in unweltfreundlicher manner and to avoid pollution as much as possible. Our hotel is equipped with solar water heating Systhemen, which use solar energy for water heating, and almost do without electricity. Since most of our guests air-conditioned accommodations like, we have provided a big part of our bungalows with electric air conditioning systems and for selected devices with low power consumption. In our 6 bungalows (No. 2-7), which are not equipped with electric air conditioners, we have installed a cooling system through evaporation. This system works best with a good wind, we usually have in Amed. For this we have ceiling fans and ventilation fans installed for better air ventilation. We promote environmental management with the aim to reduce consumption of natural resources and prevent pollution. We will waste separately and composting organic waste. We operate an organic garden where we grow fruit and vegetables and have energy and water saving systems. We communicate our environmental goals with local people and with our guests into harmony with our beautiful environment to be. The bungalows are arranged in a V shape opening to the sea and all have terraces with sea views. Exceptional comfort and space memorabilia contribute to your well-being. Guests can choose from six non-electric air-conditioned bungalows, five with double beds and choose one with two single beds, ten electric air-conditioned bungalows, eight with double beds and two with two single beds or our air conditioned family villa. Families can either use the (non-air conditioned) 6 & 7 bungalows with connecting door or our LARGE family villa on the beach directly choose. Our family villa has a separate bedroom with double bed and a living room with two single beds, two extra beds can be added if needed. The combination of Balinese tradition and modern internal design provides a comfortable and romantic atmosphere. Our non-electric air-conditioned bungalows are equipped with a cooling system which adopts the principle of evaporative cooling advantage, our system works best with a good wind, we usually have here in Amed. For better ventilation of the bungalows, we also have ceiling fans and exhaust fans installed. The bungalows, No. 1, 8 and 16 have bathtubs and some additional Larger terraces. Books in different languages you can borrow in our lobby. We use solar energy and strive to prevent pollution to be in harmony with our environment. Our guests can either be in our small pool surrounded by tropical gardens, swim and relax or in our large pool, directly on the beach swimming pools with stunning views of the sea and the Agung volcano. Refreshments will be available in our poolside bar and Amed salt in the evening to watch sports events and other programs in the salt bar on our 42 inch LCD TV. njoy Asian and Western food and drinks in our Cafe Garam and be pampered by our very attentive and friendly Balinese staff. Enjoy fresh fruit juice or a cold beer at our bar Amed salt or can be personalized with a selection of traditional massages and treatments in our Uyah Amed Hotel – SPA. 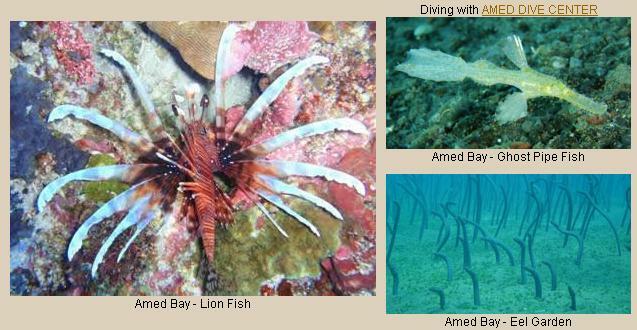 Uyah Amed Hotel & Spa Resort offers diving and snorkeling, PADI dive courses, dive trips, sailing and fishing with our dive center at Amed. We also organize tours, volcano climbing, hiking in Bali’s rice terraces and trips to East Bali’s tourist attractions. Choose hand-made souvenirs from Bali, Lombok and Java in our range, or play billiards on one of our two pool-billiard tables. operated, either in our small exhibition in the Café Garam or real sea salt, as the dry season – is (July, October) on our site operated by the people of Amed’s. Amed sea salt is a particularly delicious gourmet salt and do not forget something like this to take home with you! Hotel Uyah Amed, the ECO-friendly hotel is doing something to protect the environment and operates an environmental management system. We make veschiedene ECO programs and composting organic waste. The compost used to fertilize our trees and plants and our organic garden – the fruits that we get to reap the Café Garam than fresh fruits or juices! Hotel Uyah Amed has a nice 10m pool in a tropical garden and a second big 18 m swimming pool with a separated part for small children on the beach with a magnificent view over the sea and the Agung volcano. 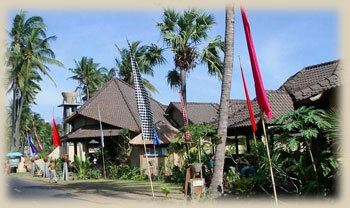 At our beach, the pool is Amed salt bar, which is also equipped with a big 42 inch LCD TV. There you can watch sports events or other programs of interest, and DVD movies can be shown. The TV is usually limited to the evening – except in cases of international football, tennis, formula 1 etc. are also possible. Go snorkeling or diving and experience the fantastic underwater world with its colorful corals and fish at the world famous Liberty wreck in Tulamben nearby and all the other Diving and snorkeling in the area. Explore view the hills, waterfalls and volcanoes, a traditional Balinese Hahnenkamf, visit Bali’s temples and ceremonies, go hiking or explore the area by bike – there’s lots of variety! We offer bike rentals and are happy to arrange excursions to the royal baths in Tirta Gangga & Ujung, the Batur volcano, Besakih Temple and Lempuyang temple, walks through the rice terraces and help you you in planning your activities. We also arrange pick up and transfer to the airport or your next destination in Bali and transfer to the Gili islands off Lombok with our sailing boat CONDOR. Full body massage, foot reflexology, cream bath, flower bath and other treatments and therapies are available in our spa – you simply walk over and be pampered by our therapists – you will enjoy it!. o Your credit card is used exclusively to guarantee your booking and will only attack if necessary, in the case of charged final cancellation charges (see cancellation). o All payments made by credit Kate in Indonesian Rupiah, based on the exchange rate on the date of payment. o To payments by credit card a surcharge of 3.0% on the amount to be paid. o We accept cash payments in Indonesian Rupiah, Euro and U.S. dollar based on the exchange rate on the date of payment. o Low season: For confirmed bookings a cancellation fee of one night per booked bungalow type, if you cancel less than 3 days before the booked Ankuftstag. o Season: For confirmed bookings a cancellation fee of one night per booked bungalow type, if you cancel less than 7 days before the booked Ankuftstag. * The check in time is between 12:00 and 17:00 clock on the day of arrival date. If you want to check in after 17:00 clock please inform us either by phone or fax: 0363 23 462 latest clock to 15:00 on the day of arrival, or by e-mail: hoteluyah@naturebali.com at least 24 hours in advance, otherwise we can not guarantee your reservation. Thank you for your cooperation. For divers we offer special diving & Hotel Accommodation Packages at our Amed Dive Center – look at our special page please, it certainly will not regret!